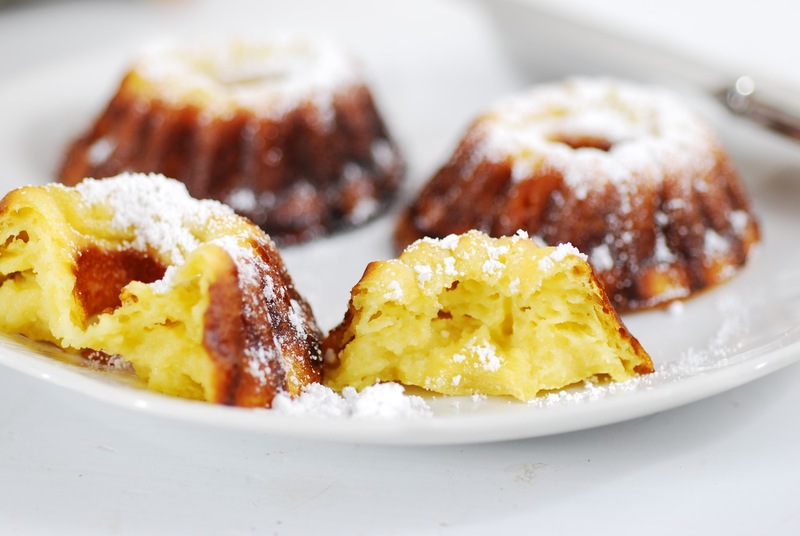 These little cakes combine the deep caramelized crunch of their shell with a light, custardy interior, flavored with Vermont maple liqueur. Dusted with powdered sugar, they're heaven. Since returning from Quebec, I've been remembering the wonderful croissants and pastries we sampled in Quebec City. I wanted to try out the new Jenn Air, acquired after the old one blew up a few weeks ago. Sifting through the possibilities, it occurred to me that I own two kinds of Vermont maple liqueur; rather than hoard them any longer, I decided to make Canelés. I've wanted to do this for some time, but didn't have an appropriate pan. 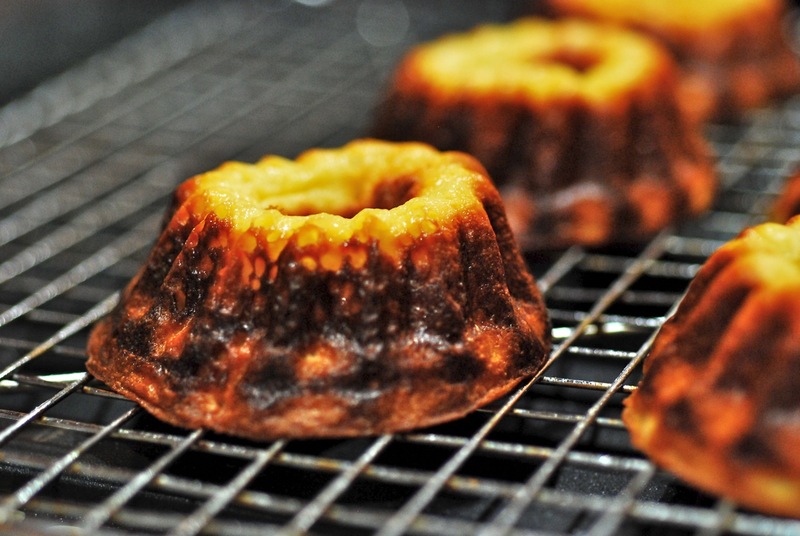 Actually, I might have been able to buy the genuine copper Canelé forms in Quebec, but didn't think of it (though I did buy a carbon steel crepe pan). However, I recently picked up a "mini-bundt cake" pan, and while the cakes are not quite as large as canonical Canelés (say that ten times fast), this pan is much more accessible. And the result is quite nice! 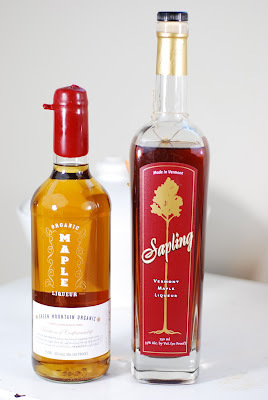 First, I needed to decide which Vermont maple liqueur to use. The traditional recipe uses rum, fyi. The only way to decide was to do a blind taste test, or several. I have a bottle of Sapling, from Saxtons River Distillery, LLC., and a bottle of Green Mountain Organic Maple Liqueur from Green Mountain Distillers. Sapling seemed like the better choice for the recipe, because it has a somewhat caramelized flavor, very appropriate for the Canelés. Another aspect that's been holding me back is that, once again, this is a recipe where the instructions always say "put it in the refrigerator overnight". This kind of advance planning and delayed gratification goes against the grain. I thought that the reason for this instruction is probably that flour and water get more sticky and smooth if you let them rest for a period of time. 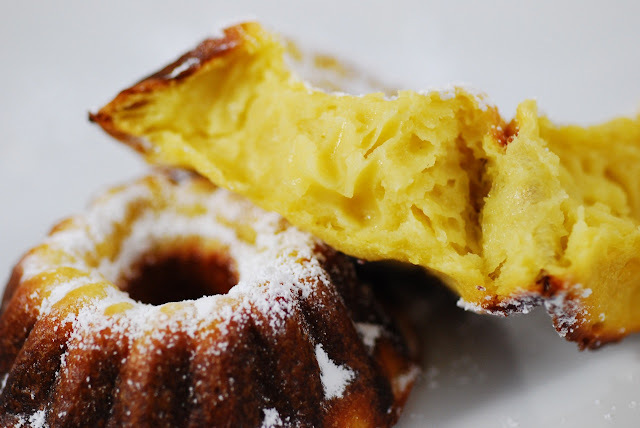 The interior of Canelés is supposed to be a custardy honeycomb, and so you need the flour to have really merged with the liquid. Of course, that is what happens with Sourdough Starter. It's always on my counter, waiting for just such an opportunity. It spent a miserable few days in my fridge while I was in Canada, and I'd been pumping it back up to full strength since my return. The idea was to use a small amount of Starter to improve the crumb up to next-day standards. This would allow me to make Canelés in one evening. We know from bread baking that all sorts of things happen to flour in the presence of liquid, time, and elevated temperature. When that liquid is milk, time allows the action of lactic bacteria to develop a slightly aged (more mellow) flavor, and making the batter slightly more acidic. So, hedging my bets, I decided to use half buttermilk in the recipe. In food processor bowl fitted with a blade, combine milk, buttermilk, maple liqueur, maple syrup, vanilla, eggs, and sugar. Process until smooth. Add flour and immediately process until smooth. In a small bowl, mix the Sourdough Starter and cooled-off melted butter. Combine with a fork until well-blended. Add the starter-butter mixture to the food processor and process until very smooth, about a minute. 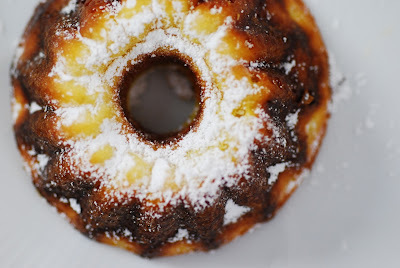 Baking: With a ladle, distribute the batter in the bundt plaque, filling 3/4 of the way to the top. Immediately place in Very hot (475F) oven and shut door quickly to retain heat. Cook for 12 minutes, then reduce heat to 400F and continue cooking for 20 minutes more. Remove from oven and invert to remove cakes. Cool completely on a rack. 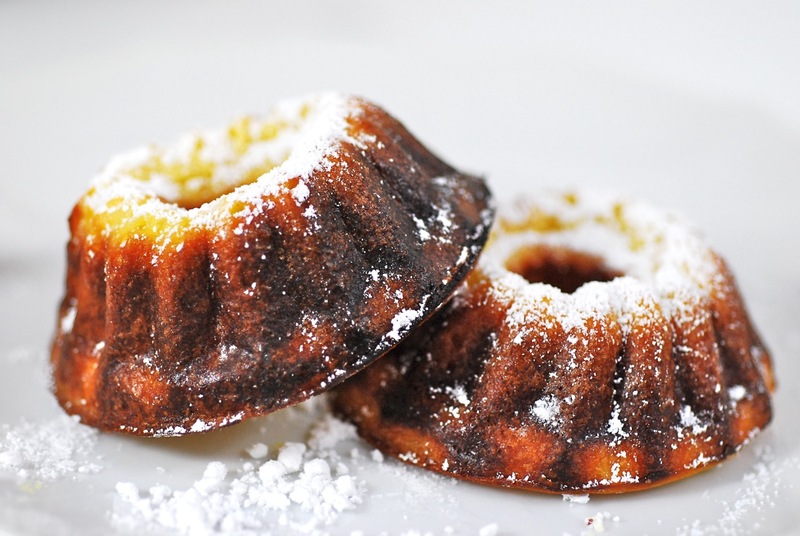 Serve dusted with powdered sugar! Hi Sue, any recommendations for substitutions on the maple liquer? 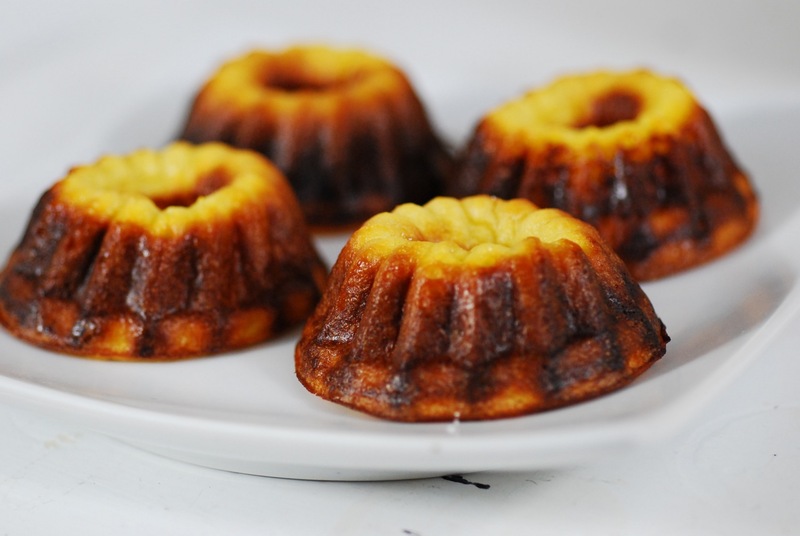 I realize that's the whole point for you, but these cakes look good to me, I'd like to try making, and I don't have access to the maple liquer - possible increase the maple syrup and use some vanilla extract??? I love this post!!! I've been playing around with sourdough cannele for a while, glad to see someone else is too - these look fantastic! Thanks Sue!